Exchange Server downtime is a commonplace issue in an Exchange administrator's life. Unscheduled or planned, each time Exchange Server goes offline, all the user mailboxes connected to the server become inaccessible. Accidental or unplanned Exchange outages can not be anticipated, however, the planned or scheduled ones can. Owing to Exchange maintenance or upgrade, a planned Exchange downtime might occur, where it becomes possible for Exchange users to access their vital mailbox data such as emails,contacts, notes and calendar by converting EDB to PST offline. Microsoft utilities ExMerge and Export-Mailbox cmdlet are capable of carrying out offline Exchange EDB to PST conversion but have certain limitations. This can be overcome by using professional third party tools such as Stellar Converter for EDB. This software is adept at converting EDB to PST offline for all major versions of Microsoft Exchange in a series of few simple steps. 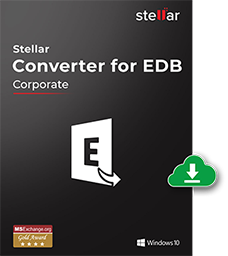 To convert EDB to PST offline, launch Stellar Converter for EDB software. The main interface window will open. The screen offers two options: Offline EDB and Online Exchange. Choose the first option 'Offline EDB'. If the location of the file is known, click 'Open EDB' to select the EDB file. If the location is unknown, browse through the available drives and volumes to select the EDB file, by clicking the 'Find EDB' option. From the 'Find EDB File' dialog box, select the required drive from the Look in list box or click Look in to search for EDB files within a specific folder. Click 'Start' to start searching for EDB files. After the scanning is complete, a preview will open up that lists all the available mailboxes in the EDB file. Click on a mailbox to view its contents in a three-view structure. Selective conversion of offline EDB mailboxes is possible using Stellar Converter for EDB. After choosing the desired mailboxes to be converted as Outlook PST file, right-click and choose 'Save As PST'. Specify the location where you want to save the PST file and click OK.